According to sunshine_dusted (Brittany) on instagram, Christine was on the same flight to Nashville as her father yesterday where he met and got an autograph from her for his daughter. Also... This could be related... Dave Stewart and Waddy Wachtel are on their way to Nashville. Dave posted on Facebook yesterday that he and Waddy were headed there Saturday. Hmmm... Wonder if there is a connection. "On way to Nashville, Tennessee this morning with Stevie Nicks and Waddy Wachtel" - Dave Stewart (his post has since been deleted from his Facebook page). I'll bet Stevie is going there to write with Dave Stewart and Waddy. She had trouble writing when she went to Key West to write last time for the Fleetwood Mac EP and came up with nothing. Christine is probably going to help her get in the Mac mood for writing. This would be great, she obviously does write well with Dave and Chris's input would also be good. definitely a positive development - maybe we get that album before the tour after all! What would be great is if they came up with the long wished for and elusive Stevie and Christine duet for the new album. 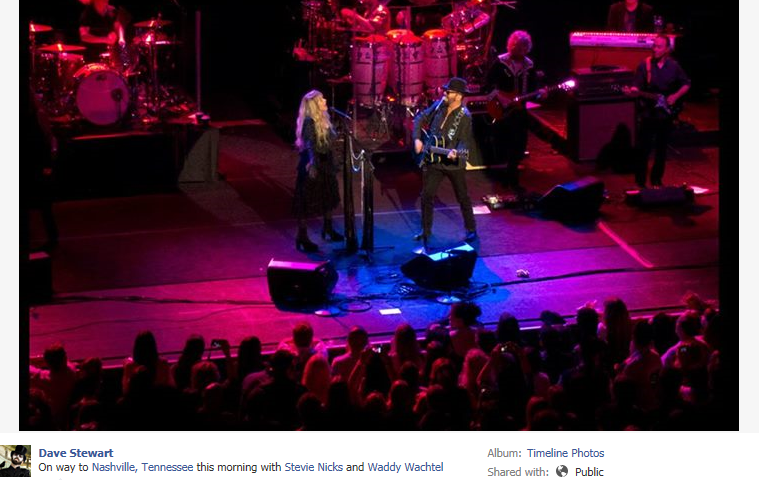 Dave Stewart confirmed to several fans on FB (via PM) that he is, indeed, working on the new Fleetwood Mac album! If the above comment is true, PLEASE provide evidence because if this is true then it has just made my week!!! It is very possible Stevie has already given over most of her contributions to Fleetwood Mac for the new project. Lindsey did not say Stevie had not written anything, he said only that she had yet to decide how and when she wanted to record. That's very different. Also, just because she didn't write in Key West doesn't mean she doesn't have new songs. She's done two solo tours and a Mac tour since IYD. It could be the material she had she didn't feel was right for EP. We don't know. Stevie's performances at the ACMA and the RRHOF ceremonies would have been booked several months ago, it's possible she handed the band some demos before she took off. I kind of expected Dave's involvement. Stevie works very well with Dave and he really gets her as a singer/songwriter, I think. Perhaps Stevie decided that she wanted Dave to produce or at least co-produce her contributions. Either way VERY EXCITING news. His exact words: "Yes and thank you. On the way to Nashville to co-produce Stevie's track for upcoming FM project." Notice that he said "track" as in singular. Now, maybe it was just a typo and he meant to write "tracks," but this is what he said to me. No more, no less. Its just like anything people can't put the right words in the story they have too twist it and made it to their liking. its todays world. Maybe Dave is only producing one track and Lindsey the others. This may be a track Stevie and Dave were working on for In Your Dreams and it didn't make the final cut. My question is why Nashville... Dave has a studio in L.A.? Stevie has an unused house that certainly did the job back in 2010 for In Your Dreams... They have rented space at The Village (or did). Unless, she's going for a country flavour to whatever she's recording? With Michelle Branch also travelling to Nashville this past wknd, I immediately thought of those country rumours tracks that Michelle and Waddy were working on with Stevie producing a few years ago - that seemed to go nowhere. RE Anonymous posting above ... I thought about that, too, that it could be a track meant for IYD that didn't make the cut. Why would Dave Stewart PM a couple of fans? The person who is reporting this on Facebook also FALSELY reported that Stevie & Christine were on a flight together to Nashville. Then slandered Stevie by claiming she refused to give Brittany her autograph. Get your facts right. Read the post above. Neither Brittany nor Stevie were on that flight. I Don't Want Dave near a Fleetwood Mac project. So I hope it's wrong. I'd be very disappointed. But, Christine will be the one to chart anyhow. I'm guarded about what people are saying. Excited Stevie is in the studio, which I assume is for new FM tracks, but agree with the above in that I don't want Dave Stewart near this project either. He will just bring it to a bland, mediocre at best, final album for them. I am the person who last year heard the backstage conversation at Madison Square Garden with Lindsey Buckingham and a staff member where he said the EP was 4 tracks, not 3 as had been reported. He also said in that conversation that he didn't think some of Dave Stewart's guitar playing on In Your Dreams was all that great. I would think that even if Dave helps Stevie write and record demos of new songs for Fleetwood Mac with Waddy and Chris taking part, that when they return to LA the songs will be rerecorded with all 5 members of the Mac. Lindsey would never allow a Mac album to come out where all the guitar parts weren't him playing. And he will also add his own production style to anything the Mac does. So I wouldn't worry that Dave Stewart will be all over a Mac album. Wasn't there at least one song from Say You Will where Stevie insisted on bringing in an outside producer because she just felt Lindsey didn't get the song? I can't find my physical copy of the CD to look it up, but Wiki lists John Shanks (who produced the song "Planets of the Universe" for Trouble in Shangri-La) as one of the producers. If memory serves from the Destiny Rules Doc, she also brought in Chris Lord-Alge to do the final mixing on "Everybody Finds Out." I'm guessing she's already written this track - or at least the lyrics and a rough piano or guitar demo to go with. Could be a demo left over from the IYD sessions that he co-wrote. I'm definitely interested to see what comes of this, but I agree with the previous "Anonymous" poster ... Even if Dave produces one of Stevie's contributions I don't think he would be "all over" the new album. Well, we could look at the top ten albums on any given week and see lots of mediocrity. I don't dislike DS. The Eurythmics are one of my favorite bands. It just seems that he's lost that "edge", and it shows on IYD. IYD is nowhere near as riveting as We Too Are One or Savage, and it was those two albums that had me excited at first about his collaboration with Stevie. Here's the thing, most talented producers sit quietly on the sidelines and focus on the artist and their music. You never really "see" them or read much about them. Someone mentioned John Shanks who I think brings out the best in what makes Stevie, well, Stevie. DS on the other hand seems starstruck by his clients and bit of an attention hound, which distracts from the music. Watch the IYD and Destiny Rules documentaries back to back. A stark difference is that one is about how two fabulous rock stars live and the other about the tumultuous process of creating meaningful music. All that said, interesting thread here. The mac needs to get in the studio and jam again. Maybe with Chris returning we'll get one more masterpiece from them along the lines of white album/rumours/tusk. Time will tell.